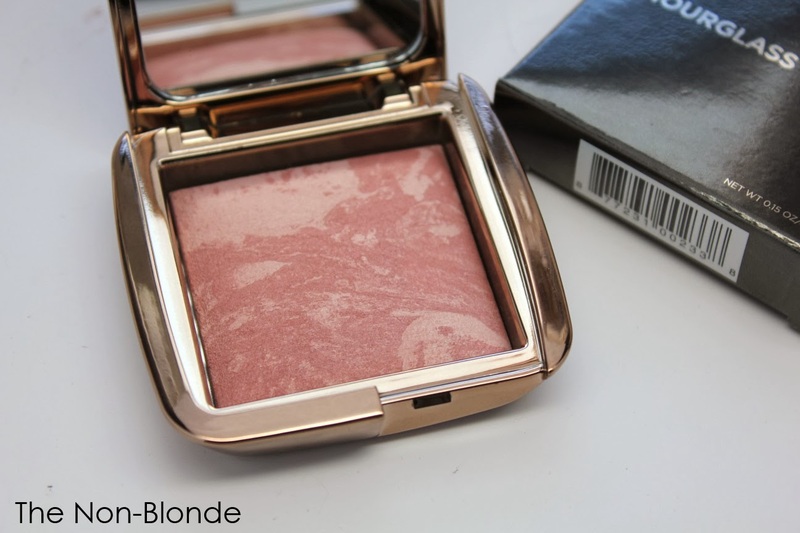 Earlier this month I ordered a couple of the new Hourglass Ambient Lighting Blushes. I already showed you Diffused Heat, but at that time I didn't even touch the other color I had, because Sephora sent me the wrong one. I ordered Luminous Flush but received Mood Exposure instead, and since the Ambient Lighting blushes sold out quickly during the VIB preview sale, I couldn't exchange it right away. Mood Exposure languished a fortnight in the Drawer of Doom, but last week I gave it another look and decided it was actually worth a try. I'm so glad that I did. Mood Exposure is described as a "soft plum" while the marbling of Hourglass Ambient Light Powder in it is Mood Light (the one in Diffused Heat is Diffused Light). It looks rather boring in the pan, doesn't it? A drab beige thing with no brightness. This is the sleeper in the Ambient collection, and it's worth your time and cheek space if your skin tone is somewhat similar to mine: an olive/beige with a visible green undertone. These blushes look dramatically different on various skin tones (CharlestonGirl bought and swatched all six on Best Things In Beauty. There's no resemblance between the way they look on her skin and mine). The pigment in your skin brings out the real color of the blush (or squashes it). 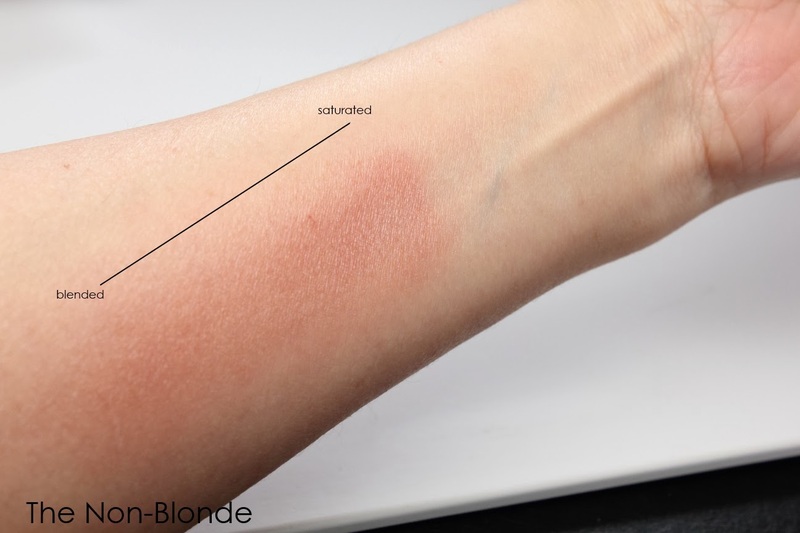 I also find that they swatch very differently on naked skin (more powdery, less pigment) than on a well-applied base. I've primed and prepped my arm the way I do my face with a moisturizer and a tinted primer, so you get the full effect. Apparently, this beige plum color of Hourglass Mood Exposure is a lot more lively on skin than it is in the compact. The addition of Mood Light powder is, indeed, brightening, which lifts the beigeness and brightens the face subtly. It works perfectly for a look that is focused on eyes or when you don't want your blush to compete with your accessories. I shouldn't have been so surprised that Mood Exposure is a good color for me. I've been wearing blushes such as Lancome Aplum and Benefit Dallas for years. This offering from Hourglass is more delicate and luminous, but works in a very similar way. Bottom Line: a brilliant mistake. 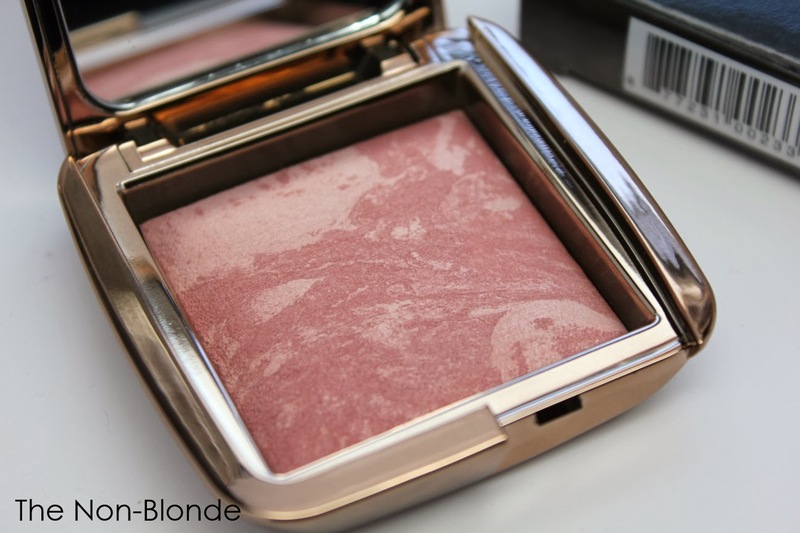 Hourglass Ambient Lighting Blush- Mood Exposure ($35) is available from select department stores and Sephora. Hourglasscosmetics.com is out of stock at time of posting, but they should have it back soon. Why didn't *you* buy and swatch all six colors? It would have been more helpful. I'm sure it would have been very helpful, but my policy is to only buy items and colors I expect to use, and several of the colors in the range are not my thing. You're right. I love that brush and it works with this blush perfectly. I also find that Mood Exposure plays well with just about every brush I tried-- Hakuhodo 210, Chanel blush brush, Tom Ford. Good to know...I have that Tom Ford blush brush as well. I kind of like to keep it just for TF blushes though (don't know why!). I bought Luminous Flush & Diffused Heat, I kept looking at this one and putting it down but I will definitely get it as well. I'd say I'm on the darker side of fair and closer to neutral in tone and it looks good on me as well. What I'm finding though is that I have to work with a light hand with all these blushes (well, except for the Ethereal one which is chalky on me) because the colors can build up fast. Evelyn, you're right: the colors can really build up quickly. A super soft brush and a light hand are necessary. I guess that's why I'm so taken with this color. It's muted enough not to look clownish. It was brilliant. :). I love the color on this one. I've worn it two days in a row. You are so right .... depending on your skin colour - they change! I bought just ONE blusher -Mood Exposure and its more pinky on my skin as I am pale . Really lovely review (quite shocked at that very rude comment above)-I did buy 5 of the 6 blushes and am really happy with them-I think they're so pretty! I've had my eye on these since the day they released their photos! Cant wait to get my hands on them!